It's 2 am, my two-year-old just woke me up because he needed a drink. So we head into the kitchen, so I can get him some water. While I’m there I realize that I’m thirsty too so I get my self a drink. All is fine until I turn to put my cup back after drinking my water. I hear a crash. He has just dropped his glass and glass shards went flying across the dimly lit kitchen. I scoop him up because of course he is crying and to protect his little feet. I tell him its OK it was an accident and he is OK. I’m not mad, I’m just happy he is OK. It didn’t hurt him at all, didn’t hit his foot or face as it fell from the counter-top that is above his head. I took him to bed and get him settled in and back to sleep. One of my other kids may wake up and wander into the kitchen so I can’t just leave the mess until morning. I grab the broom and head for the broken glass. As I’m walking towards the mess I put the broom down in front of me to keep my feet safe. As I’m looking around to see where most of it has gone I realize that this is kinda like life. 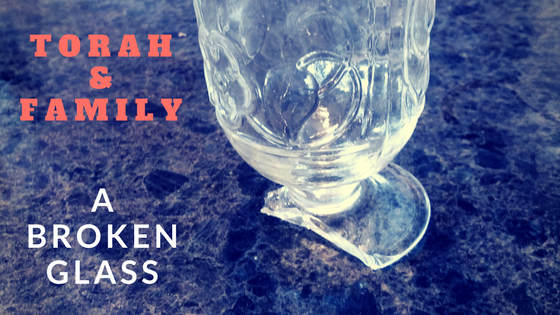 Imagine the glass unbroken as my life before Torah. It was in my view an acceptable life. In my eyes I was doing what I thought was right and going about my life OK….until I wasn’t ...... until my life fell and shattered. The pieces of my life are scattered everywhere, and I begin to sweep away what is unsafe for me. I step a lot more carefully. As I’m cleaning up the mess I also see a parallel with my family. Broken and scattered all over the place. Pushing the broom in front of my feet to ensure a safe place to put my next step. I got to where I could reach the glass and pick it up. Its not nearly as broken as I thought is was. In all intents and purposes its still a working glass and safe to drink from. Only the base of the glass was damaged. We can try to piece our base, our family, back together but you would always see the cracks and be missing a piece here or there it may be tiny, but it would be missing all the same. Things will never be the same as they were before. But you can know that even without those pieces you can stand and function just fine without them it may hurt, and you may wobble from time to time. As long and you set it down and keep the balance (Torah) you can stand tall. The glass was broken, and we threw it out. Once we start living in Torah we realize how much we need to change and begin to clear out our old broken ways. We then got a new glass, a better glass with a new stronger base. That's what our life becomes when we live in The Word. A new creation, with a much stronger base, a house built on rock instead of sinking sand. It’s now almost 3 am I’m heading to bed. Good night all!